This registered cover was sent from Conakry. Conakry is on the western African coast north of Freetown, Sierra Leone. The destination was Ouidah which is near the coast in Dahomey (now Benin). It is about 30 km west of Cotonou, the principal port on the coast of Benin. Registry was indicated by a bold boxed R.
The 322 at the top may also have been added as an identifier. and Commerce red on straw colored paper (Scott 13). CONAKRY | GUINEE FRANCAISE double ring CDS. to Loango mail steamer on route No. 2 until August 7. It arrived in Cotonou, Dahomey, on August 14. Both of the preceding events are confirmed by the two transit marks on the reverse. 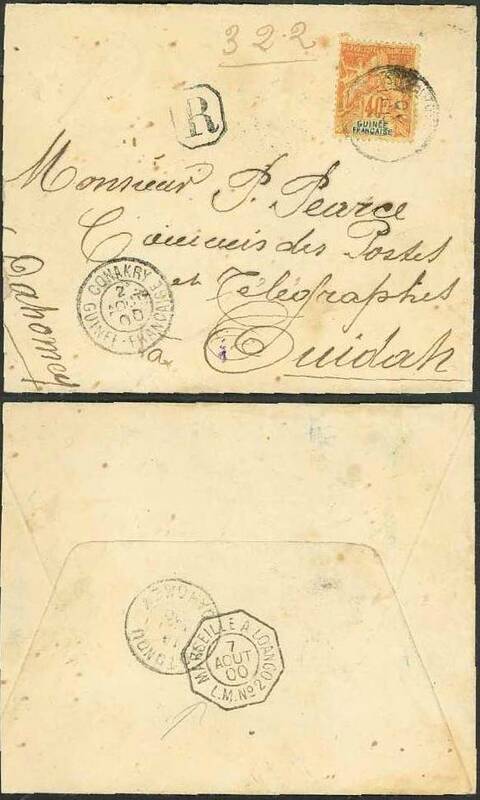 There is no indication of when the cover arrived in Ouidah. The total trip was about 2000 km. The mail steamers made stops at many ports along the way.